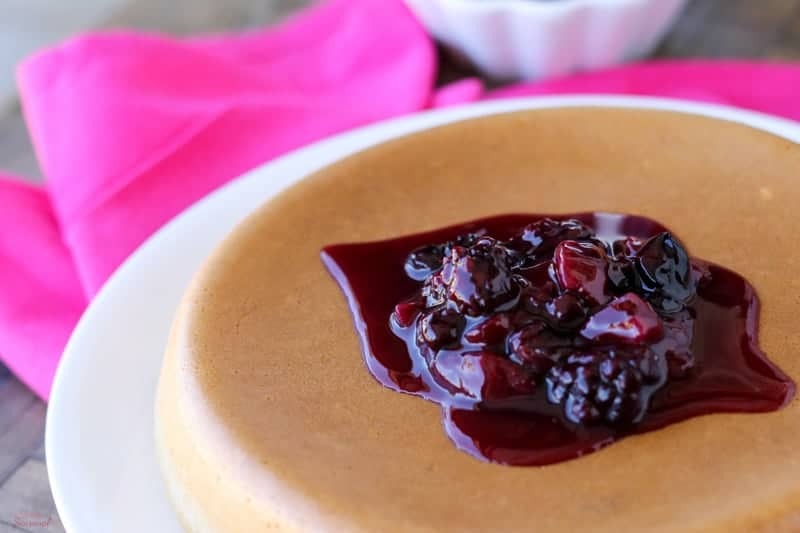 Instead of standing over the griddle flipping pancakes all morning, cook everything at once and make one Crockpot Express Giant Blueberry Pancake the whole family will love! A few years ago, Japanese Rice Cooker Pancakes captivated the internet. I remember seeing a Buzzfeed post about several different things you can make in a rice cooker like a giant pancake! Then along came the new and improved electric pressure cookers and the poor rice cooker has taken a back seat to the more versatile multi-cookers, like the Crockpot Express. Guess what? 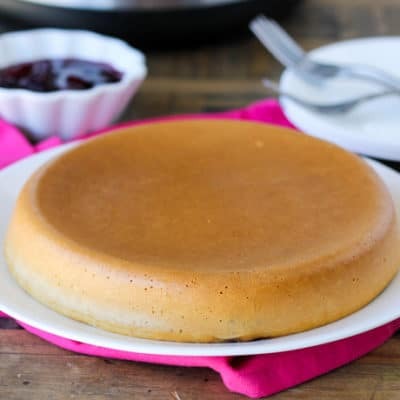 You can make a giant pancake in a pressure cooker, too! I’m adding this to my list of successful Crockpot Express Recipes! The Crockpot Express is very similar to the Instant Pot. It has the same basic functions and works in the same way. There are a few differences, though. The Crockpot Express has a non-stick inner pot instead of stainless steel. 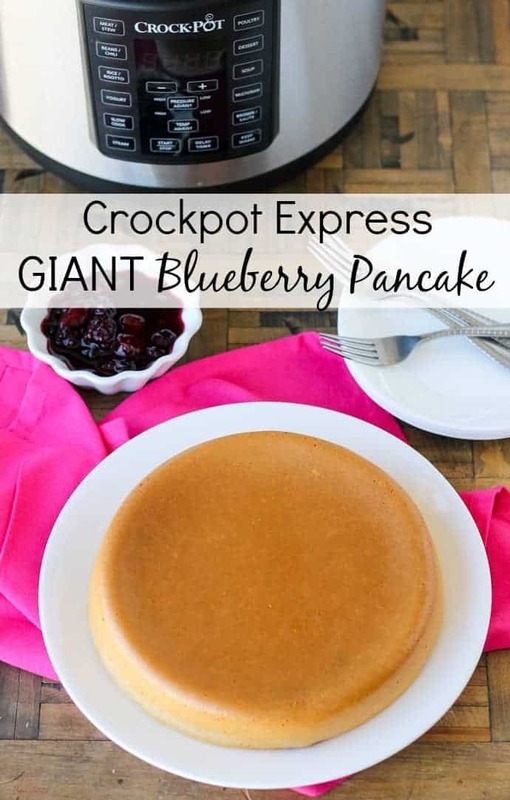 There are definite pros and cons to each brand, but for this Giant Blueberry Pancake, the Crockpot Express is perfect. The non-stick pot cooks it evenly and getting it out after it’s done is so easy! 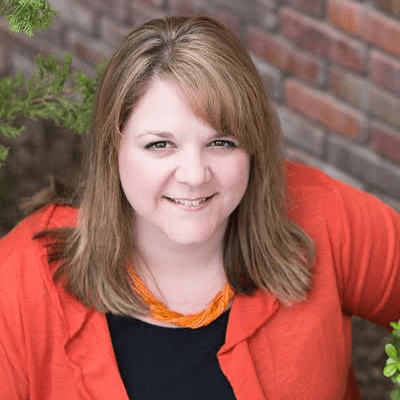 If you have an Instant Pot or even another brand of electric pressure cooker, I can’t guarantee that this will work for you. If you are successful, please leave a comment with how it worked for you and what setting you used! Just look at that beautiful brown outside! It’s so evenly colored and makes for a nice crispy shell. These Japanese style pancakes are quite plain in flavor, so you will probably want something sweet on top. 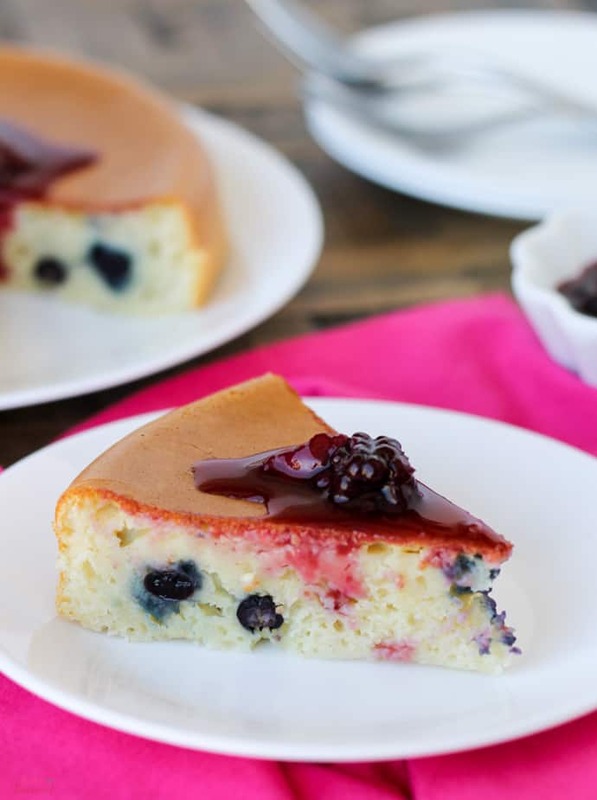 I added vanilla extract and fresh blueberries to the basic recipe, and then topped mine with delicious Triple Berry Sauce. My kids liked their slices with maple syrup, fruit and whipped cream. Instead of standing over the griddle flipping pancakes, toss everything into your Crockpot Express and make one Giant Blueberry Pancake the whole family will love! In a large mixing bowl, stir together flour, baking powder and sugar. Add the wet ingredients to the dry and stir just until mixed. Do not over mix! Pour the batter directly into the inner pot of the Crockpot Express (you do not need to grease the pan.) Add blueberries. Close and lock the lid and turn the steam release valve to closed. Press Multigrain and adjust pressure to LOW. Leave the timer at 40 minutes. It takes about 8 minutes to switch from Heat to the cooking timer and it doesn't come to pressure. When the cooking cycle is done and you hear the beep as it switches to Keep Warm, flip the steam release valve to open and open the lid. It doesn't actually come to pressure, so the lid will likely be unlocked already. Check to see if the pancake is done by pressing the top. It should spring back, and the sides should be pulled away from the pot. You can also check by inserting a toothpick and making sure it comes out clean. Gently slide a silicone spatula around the edges and underneath to lift it loose. Then slide it out onto a plate! Serve with syrup, fruit, or whipped cream for a special treat! 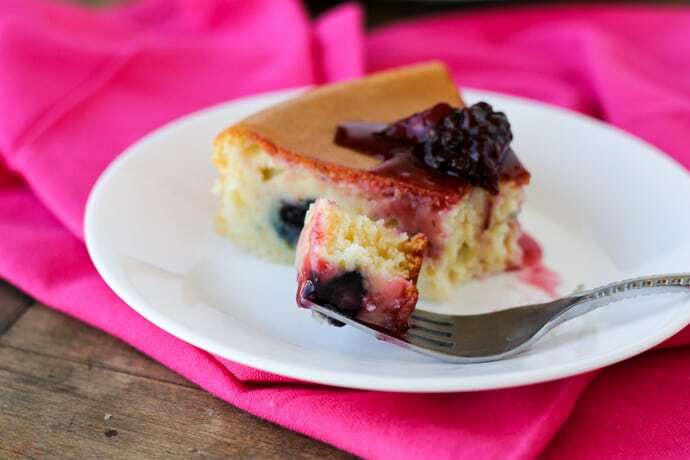 Each slice of this Crockpot Express Giant Blueberry Pancake is big and quite filling. The texture is more dense than a typical pancake, and it’s got a crispy outer shell. My boys gobbled them up, and I really enjoyed not having to stand over a grill flipping flap jacks for an hour! If you’re already a Crockpot Express owner, we’d love to have you join our Crockpot Express Community on Facebook. 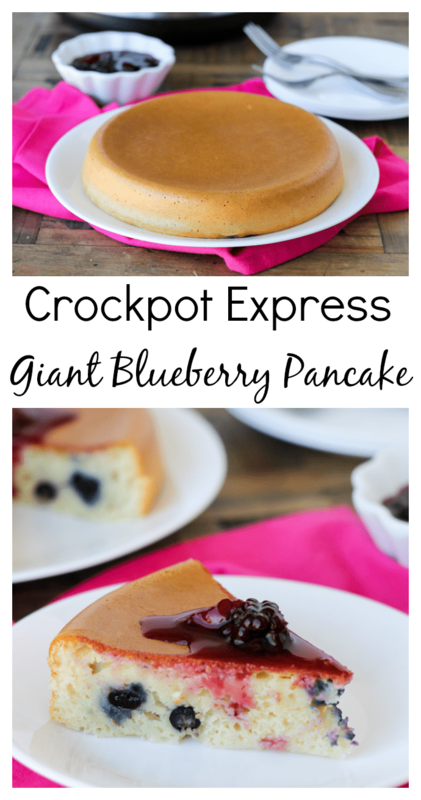 Don’t forget to pin this Crockpot Express Giant Blueberry Pancake for later! Has anyone used this in the new 8qt CPEXL? Should I use 1 1/2 times the ingredients? Hi! I’m wondering if you ever got this to work in the 8 quart? I’m just got an E6 and will attempt to restart it. Thank you!! I just replied to you on Facebook, but I’ll answer here, too, for future users 🙂 I do not have an 8 qt so I haven’t tested it. There’s no multigrain setting on the 8 qt, which is the first problem. I know that all the settings are supposed to be the same, but for some reason-even on my 6 qt-I get the best results with the multigrain setting. That’s problem #1. Then there’s the issue of the ingredients getting spread out too thin when in the larger pot. If you wanted to try it again, you’d need to increase the ingredients by 1/3 to make the ratio the same. Then try it on Manual, high pressure. Good luck! With a new baby in the house my kids were missing our pancake breakfast. This worked great and is easy and fast. Mix, pour, push a button. Yummmmm. Served with jelly and whipped cream. Hi, I don’t have a multigrain button. I to have a dessert one though! I tried it on this but it gave me a fault e6 about half way. Most of the cake was cooked but the top was still batter. What did I do wrong? Would love to try this again. You’re using a CPE, though, correct? I see your address is a .uk so you must have one of the European machines that replaced Multigrain with Manual. Since I haven’t used that exact CPE, I can’t be certain if it’s exactly the same as mine. However, the pressure buttons should all be the same- they just default to different times. So any pressure button should be fine, if it’s set to low pressure and for 40 minutes (so dessert should work.) I’ve made mine a few times and it’s been successful, but I’ve never tried it on another setting. You could try it on Rice and just add an additional 10 minutes after the 30 minute cycle is over. ??? If you do try it again, please let me know how it turns out! I made this and it looked just like the picture. I loved it with butter and a bit of syrup. It is not real sweet but very moist and it was good.